Arguably the greatest player of all time, Serena Williams has re-written the record books in a way that no tennis player – male or female – has ever done before. She has achieved everything there is to achieve in the sport, and is still going strong even after attaining motherhood. 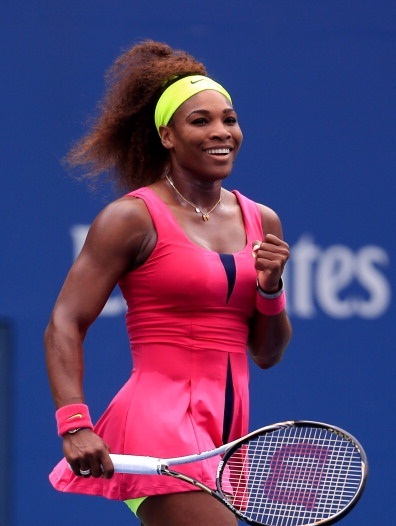 The most striking thing about Williams is the level of dominance she has exerted over the rest of the field. Few athletes, if any, have dominated their sport like Williams she has; the gap between her and the next best players on tour has been astoundingly large for the better part of 20 years. When she is at her best, no other player can even come close to her, let alone defeat her. Williams is perhaps the best prototype of the modern aggressive baseliner, capable of big groundstrokes off both wings. She prefers to stand at or just behind the baseline for the most part, and hits the ball flat and hard. Her backhand is considered her more solid wing but her forehand can generate higher pace, and she uses the forehand to dictate the play in longer rallies. Williams is widely considered the best server in the history of the game. She regularly reaches double figures in her ace count during a match, which is a rarity on the women’s tour. With a conventional grip and smooth serving motion, Williams frequently unleashes big serves to save break points or get out of difficult spots. Williams doesn’t come to the net a lot, but she is fairly competent with her volleying. Over the years she has started approaching the net more often, putting away winning volleys set up by her punishing groundstrokes. Williams has very few weaknesses, but her defense could be said to be one. While she is very quick around the court, her tendency to stand close to the baseline means that she can’t always retrieve big shots hit into the corners by her opponents. Her forehand can also sometimes become error-prone, especially on the return. Williams was born in Saginaw, Michigan. She and her family moved to Compton, California early on, and subsequently to Palm Beach, Florida, where Serena and her sister Venus joined Rick Macci’s tennis academy. Both Serena and Venus Williams were coached by their father Richard until they turned pro and started winning Slams. Serena added Patrick Mouratoglou to her coaching team in later years. She married Reddit co-founder Alexis Ohanian in 2017, and gave birth to her daughter Alexis Olympia Ohanian on 1 September 2017. It later emerged that she was 8 weeks pregnant at the time of the 2017 Australian Open, a tournament that she won. Serena and Venus, dubbed ‘the Williams sisters’, formed a path-breaking duo at the turn of the 21st century. They created many firsts, both for sisters and African-American players, by competing in and winning Grand Slam finals in the late 1990s and early 2000s. The Williams sisters achieved tremendous success despite having faced racism and discrimination at several points of their careers, which made them inspirational role models for countless youngsters across the globe. Moreover, their style of play was also revolutionary; they introduced the women’s game to hitherto unseen levels of power and athleticism, and set the template for success in the modern era. Over the last decade, however, Serena has carved out a wholly unique place for herself in the sport, distinct from that of her sister. She has reduced the women’s tour to ‘Serena and the rest’, and any tournament that doesn’t have her in the draw is immediately thrown into chaos. She has also repeatedly spoken out against racism, sexism and other important issues plaguing society, augmenting her role model status even more. That said, she has also had to deal with a fair share of controversies over the years. At the 2001 Indian Wells tournament, she and her sister were scheduled to face each other in the semifinal, but Venus withdrew just minutes before the match due to injury. That prompted boos and racist chants from the crowd, which led to both the Williams sisters boycotting the tournament for more than a decade. At the 2004 US Open, in her quarterfinal against Jennifer Capriati, Williams suffered a series of blatantly wrong line calls, which reportedly hastened the introduction of the Hawkeye replay system in tennis. At the 2009 US Open, she incurred a hefty fine after launching a verbal tirade laced with threats against the lineswoman who called a foot fault against her. Most recently, she accused chair umpire Carlos Ramos of sexism after he handed her a violation for illegal on-court coaching during the 2018 US Open final. Still, Serena Williams’ accomplishments and contributions to tennis far outweigh the controversies, and her glittering legacy will remain etched in the history books for eternity. WWE: Serena Williams to sign with WWE post retirement?